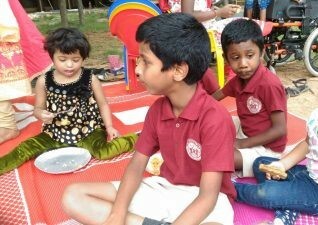 Mithra Special School for underprivileged children is dedicated to providing opportunity and a safe haven to the less fortunate and differently abled children in Bangalore, around the RT Nagar area. “During my time volunteering with proVISION ASIA, I accompanied the Mithra Special School for underprivileged children to a local horse ranch on a field trip. It was so evident that the children had an amazing time and me on the other hand, I had a blast! This field trip was not only a fun time for these children but was an essential educational time of learning, and let loose. It was overwhelming observing all these precious children enjoying their picnic. Something they do not get to do very often I presume. I especially noticed the fun they had getting to feed the horses in the stable. I spent a lot of time with these children getting to know each one a little better. As the day moved along and the conversations got deeper, one of the children, Jaya Bhargav caught a special corner of my heart. I ended up spending a lot of time with him and got to know him a little more personally. He’s 10 years old, seemed extremely energetic and was seen jumping out of the school van upon our arrival at the farm. He then ran towards the open fields and as though that was his freedom, claimed the prize of fresh farm air! Away from school and back at home though, Bhargav rarely leaves his house. His parents are afraid of it, afraid of what others might think and say about their son. He comes from a family of four which is his real support system. I was told his family members refuse to treat him as though he has disability at all. After talking with a few instructors from Mithra, I was told that without proVISION ASIA and their Mithra Special School for underprivileged children, Bhargav would never even dare to leave the house. It was also fascinating to see that Bhargav aspired to be a leader in many ways and expected the other children to look upon his ways and copy what he did. He loves indoor games and thoroughly enjoys the snacks and lunch breaks every day. His favorite food is the ragi malt drink in the mornings. There is so much more I could go on about Bhargav but all I can say is I was blessed to learn so much in the little time I spent with the Mithra special school for underprivileged children. In conclusion, through volunteering with proVISION ASIA, I was able to spend time with these children, getting to know them and really having fun with them. Above all, I learned humility (a life lesson). It was an amazing experience overall and I’d urge everyone to take some time off and visit Mithra for a truly humbling experience. I promise it will be worth every second of your time! Mithra Special School has 21 students, 4 teachers, 2 assistants and 1 driver. Our students range from 4 years old to 12 years old with disabilities ranging from Cerebral Palsy to hearing impairment to Muscular Dystrophy to Down Syndrome. The new school year has started in an exceptional new building! In this much bigger facility, they have 5 classrooms, spacious accessible bathrooms, indoor playground, 24 hour surveillance and access to the kitchen and physiotherapy centre every day. This project is one of our BIGGEST ones and we would love for you to get involved with us! If you are interested in volunteering with us, please call us at +91 8023624312 or email us at info@provisionasia.org and for more information on our projects, visit www.provisionasia.org today.